From head to tail this noise box is just 20 mm. It was found in Phoenix, Arizona on 17 July 2008. It is a male - only males make the characteristic cicada sound. 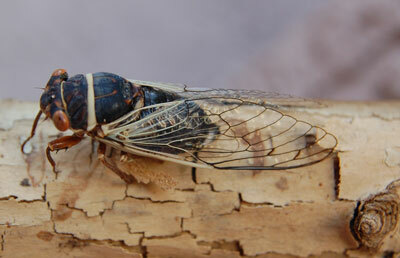 There are many species of cicadas in Arizona and the Sonoran Desert. This is the most common at lower elevations and in the cities during mid summer. They generally begin emerging from their below ground habitat soon after the summer solstice. Cicadas are 'true bugs' with piercing-sucking mouthparts. As adults they feed little - mostly watery sap. As nymphs they live underground feeding on sap of tree and shrub roots. Their life as adults is a short one - normally just a few weeks at most. Males use their sound making for attracting mates to suitable egg laying sites. But the loud sound also serves as a defense. Pick up a male cicada and it immediately lets loose with its startling rattle. For a bird, eating a male cicada is a waste effort. Its body is completely converted over to the efforts of noise making and mating - a lot of indigestible chitin (the tough exoskeleton). Thus upon hearing the rattle a bird may just release the bug. A silent female on the other hand would be a nutritional bonanza with its load of eggs. The large eyes of cicadas allow them to detect and evade many predatory encounters.